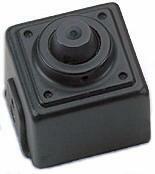 Mini spy camera measuring less than 1" square with 750 lines of resolution. The KPC-E23 mini security camera may be tiny but it provides excellent image quality with its Sony 960H CCD sensor and precision cut pinhole lens. It even has an on-screen-display for multiple image adjustments like ATR (Adaptive Tone Reproduction) which provides improved overall contrast so that light and dark areas can both be seen in the same image. You also have the option to make this camera wireless with any of our transmitter/receiver sets.